Lock in a great price for Motel One Bremen - rated 8.9 by recent guests. Nice rooms, tasty breakfast, kind hotel staff. Good location very close to the downtown. Perfect business hotel, pleasant staff, good breakfast. Convenient to Altstadt and transportation. We will go this year several times to Bremen and hope to be able to stay each time at Motel One. Super clean room and bathroom. Perfect location. Fair price. Location. Quality of room. Lovely lounge / bar area. The bed was so comfortable & we even had a room overlooking the nice courtyard. Close to centre of the old city (walking distance) and railway station is 15 mins or 2 tram stops that stop outside building. Non smoking throughout. Bike hire available lots of electrical sockets.Comfortable lounge area with competitively priced food and drinks. Motel One Bremen This rating is a reflection of how the property compares to the industry standard when it comes to price, facilities and services offered. It is based on a self-evaluation by the property. Use this rating to help choose your stay! 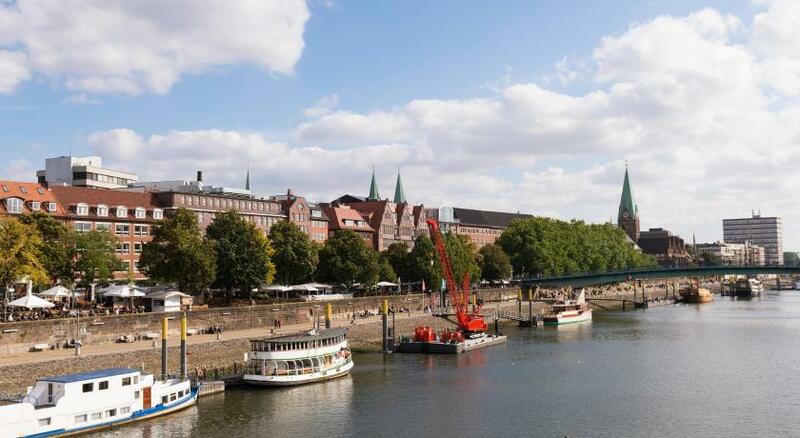 Centrally located in Bremen’s Old Town, this modern hotel is just 0.9 miles from Messe Bremen exhibition grounds and 1.9 miles from Weser Stadium. It offers free WiFi and a 24-hour reception. Motel One Bremen features stylish non-smoking rooms decorated with contemporary furniture. Each is complete with air conditioning and flat-screen TV. The en suite bathroom includes complimentary toiletries, a rain shower and granite stone design elements. A buffet breakfast is served every morning in the hotel’s dining room. Guests will find numerous restaurants, cafés and shops within a 2-minute walk of Motel One Bremen. Nearby attractions include the historic town hall and St Peter’s Cathedral. The Schlachte (medieval harbour) is 450 yards away. Bremen Central Train Station is 0.7 miles from Motel One Bremen. Bremen Airport is also only 1.9 miles away. Mitte is a great choice for travellers interested in Old Town exploring, city trips and restaurants. This property also has one of the best-rated locations in Bremen! Guests are happier about it compared to other properties in the area. Motel One Bremen has been welcoming Booking.com guests since 18 Jul 2014. When would you like to stay at Motel One Bremen? This stylish, air-conditioned room includes a flat-screen TV, work desk and a private bathroom with a rain shower. Hotel surroundings – This neighbourhood is a great choice for travellers interested in Old Town exploring, city trips and restaurants – Check location Excellent location - show map Guests loved walking around the neighbourhood! The highlight of Bremen's historic centre is its stunning 15th-century town hall, a UNESCO World Heritage Site. Pro tip: in the building's cellar are some of the oldest wines in Germany. House rules Motel One Bremen takes special requests - add in the next step! Motel One Bremen accepts these cards and reserves the right to temporarily hold an amount prior to arrival. One of the most picturesque neighbourhoods in Bremen! Bookingcom does not offer the pos sibility to reserve a parking place. There was no free parking place in the hotel parking, it was neces sary to use the public parking house away from the hotel. Pretty much inconvenient. Also not pos sible to stop in front of the hotel to pick up or drop off the hotel guests. Bar in the evening is pricey and ordinary. Well, that was an unexpected surprise. I always thought that the network hotel would not be able to provide the same level of comfort as, let's say, the boutique hotel, but I was pleasantly surprised. Price/value ratio exceeded all my expectations. Room was small but very cosy, with everything necessary (special thanks for the USB charging points!!). We asked for a quiet room and it was indeed extremely quiet - the hotel takes the sound insulation very seriously. After a very relaxing night of sleep (again, special thanks for different size pillows and a great mattress) we got to the breakfast area and yet another pleasant surprise. A lot of attention to the bio food, and finally a hotel that provides lactose-free, soy and almond milk without me specifically asking about it. The greeting phrases on the boiled eggs just made my day!!! Very up-to-date facilities, absolutely modern and pleasant design, kind and honestly smiling staff - I could not wish for anything else. Perfect stay, really! Suggestion for the staff: please change your breakfast furniture. The chairs and tables are much too low at the ground for me. Not very comfortable dining/breakfast chairs and too tiny and small tables. Maybe it will do for drinking a cocktail, but for breakfast I prefer more comfortable chairs and tables. The hotel room was a little bit small in size, but doable. A safe in the hotelroom was missing. all good. Nice breakfast - good value for money. Room was clean and comfortable. Bed too soft. Very basic breakfast. The receptionist was not very nice. It is more than a motel. Good beds, nice room.